Jeep has expanded its Cherokee range downwards to include a two-wheel-drive on-road station wagon, a low cost model called the Jeep Cherokee Sport. But having just spent a busy couple of days with senior people from the iconic American maker of off-road vehicles it’s obvious their hearts are still strongly in favour of the tough off-road models. So well is the local Jeep importer doing in well in Australia at the moment that two Americans made it across from head office in the US of A to Wilpena Pound in remote South Australia for the occasion. They are the program manager, Jayant Acharya and chief stylist Greg Howell. The designers at a few iconic marques struggle with the need to retain the traditions of the old, with the need for something new. Porsche with its 911 is the best known, but those penning updates of the new Mini, VW Beetle and Fiat 500 all suffer from the same restraints. Greg Howell was given a clean computer screen by Jeep’s top management and has come up with something different – though in some ways the same. He chose to take the ‘revolutionary’ route, not the expected ‘evolutionary’ one. The seven-slot grille had to be retained, as did the squared-off wheel openings. There are still major arguments amongst Jeep purists about the slope-back of the top of the vertical grille, and we still have to admit we aren’t keen on the shape ourselves. However, Jeep Cherokee comes with two distinct front ends; one for the models aimed mainly at the street, with a relatively low spoiler. This also carries across to Cherokee’s aimed at light-duty work off sealed roads. 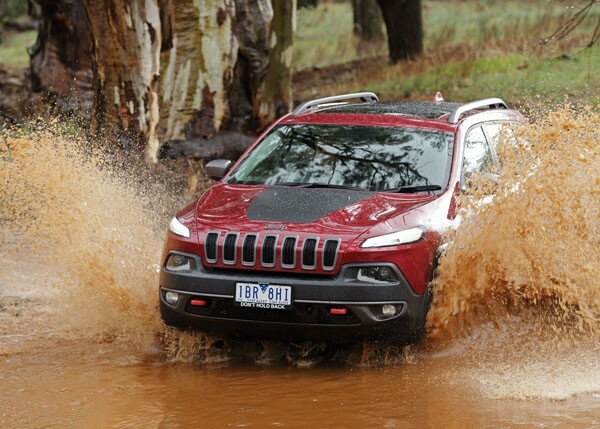 Then there’s the ultra-tough Trailhawk – and we just love its shape. Jeep Cherokee Trailhawk has a smaller lower-grille, higher ground clearance, less front brightwork and larger protection panels. Naturally the Trailhawk has significantly better front and rear angle, good ramp-overs and higher ground clearance than the 2WD Cherokee and their milder 4WD brothers. Trailhawk has an approach angle of 29.8 degrees, a departure angle of 32.1 degrees and breakover angle of 23.3 degrees. Running ground clearance is 220 millimetres. Inside, the all-new Jeep’s styling is right up to date. Thankfully, it still has the rugged look that will appeal to traditional Jeep buyers. There’s a full-colour 7-inch reconfigurable LED instrument cluster that’s backed up by an 8.4-inch colour touchscreen media centre with a variety of functions. Current engine choices are a 2.4-litre four-cylinder petrol engine and a 3.2-litre petrol V6. Interestingly, both are transversely mounted rather than fore-and-aft which has been the norm in serious 4WDs until now. The four-cylinder is largely Fiat designed, though assembled in the United States. Chrysler-Jeep is controlled by the Italian giant these days, so this is an ultra modern powerplant. Rejoicing under the name of Tigershark it produces up to 137 kW of power and 232 Nm of torque. This engine uses a column of oil in place of a mechanical link between the camshaft and intake valves. This allows extremely precise control of the intake-valve events. The Jeep V6 is familiar to us as it uses the most recent version of the famed Chrysler Pentastar powerplant. It manages a neat 200 kilowatts, with torque of 232 Newton metres. Naturally it’s built in the USA, but not in the same plant as the four-cylinder. A 2.0-litre four-cylinder turbo-diesel will arrive downunder later in 2014, but the importer would rather wait until closer to its launch before going into details. All Jeep Cherokees have a nine-speed automatic transmission, a world first for this class. This huge spread of gears allows everything from sharp takeoff to low-revving cruising with minimum fuel consumption and emissions. However, see our note on this nine-speeder in our ‘driving’ section. No fewer than three 4WD systems are on offer, Jeep Active Drive I, Jeep Active Drive II and the full-on Jeep Active Drive Lock with a two-speed PTU, low range, and locking rear differential. It gives a crawling ratio as low as 56 to 1. All the 4WD systems feature Jeep’s Selec-Terrain traction control system, which allows the driver to choose the on- and off-road setting for optimum performance. Five settings are offered: Auto, Snow, Sport, Sand/Mud and Rock. 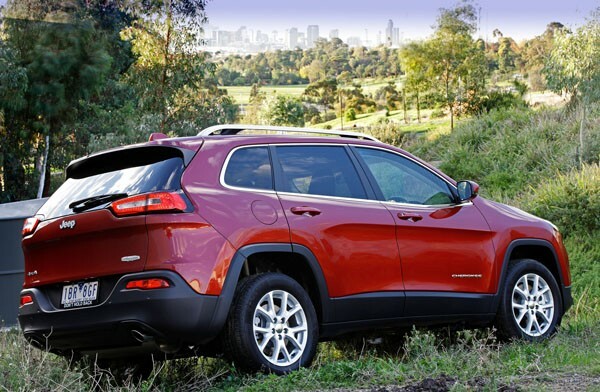 The Jeep Cherokee has a smart rear-axle disconnect system to reduce energy loss when 4×4 capability isn’t needed, thus improving fuel efficiency and cutting emissions. There is a multitude of electronic systems to stabilise and control the vehicle should the driver make a mistake. These include Forward Collision Warning-Plus; Lane Departure Warning-Plus; ESC; Electronic Roll Mitigation; Rear Cross Path detection; and ParkView rear backup camera with dynamic grid lines. There are 10 airbags should the driver, or another road user, still get something seriously wrong. There’s good seating for five, with numerous luggage and/or passenger combinations. Cherokee has a 60/40 split folding seat that moves fore and aft, as well as a fold-flat front passenger seat with covered in-seat storage, the latter not offered in the lowest cost models. 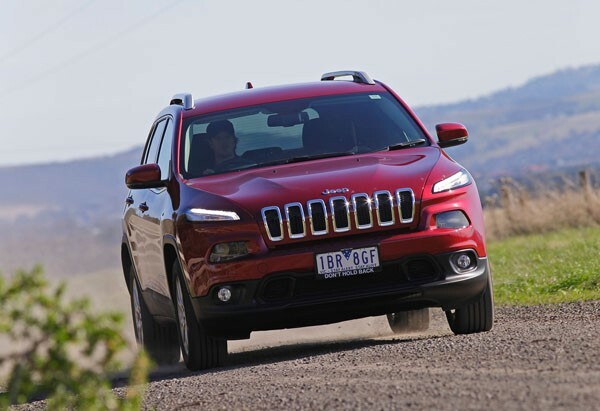 Our initial driving was done in the two-wheel-drive Cherokee Sport on bush roads in outback South Australia. It felt like a good modern sedan, with impressive body rigidity and excellent noise and vibration damping. Smooth, sophisticated and spacious it will appeal to someone who wants a normal station wagon, but one with iconic heritage in its makeup. Though we daringly took the Cherokee up to speeds as high as 112 km/h (and thankfully didn’t crash and die) at no time during our testing did it get into top (ninth) gear. So high is the overall gearing that the best we could manage was eighth. In countries with more sensible speed limits we are advised that ninth will start to come into use at about 120 km/h to further cut fuel use. An early morning start after we left our tents the next day saw us enjoy magnificent ‘real’ four-wheel driving in Cherokee Trailhawks. Jeep engineers have, yet again, proven they are at the leading edge of this area. Though we played with the different electronic settings as we climbed and descended steep rocky and muddy slopes, found ourselves simply turning the knob to ‘Auto’ and letting the 4WD do its own thing. Cherokee makes things so simple that in many ways all you have to do is steer it. Simply brilliant. New Jeep Cherokee is built to a high standard in the United States at Chrysler Group’s Toledo (Ohio) Assembly Plant. It’s an impressive vehicle in many ways and we wouldn’t be surprised to see sales being limited by available supply in the early days. If you’re halfway interested it might be smart to make an early move. Note: These prices do not include government or dealer delivery charges. Contact your local Jeep dealer for driveaway prices.